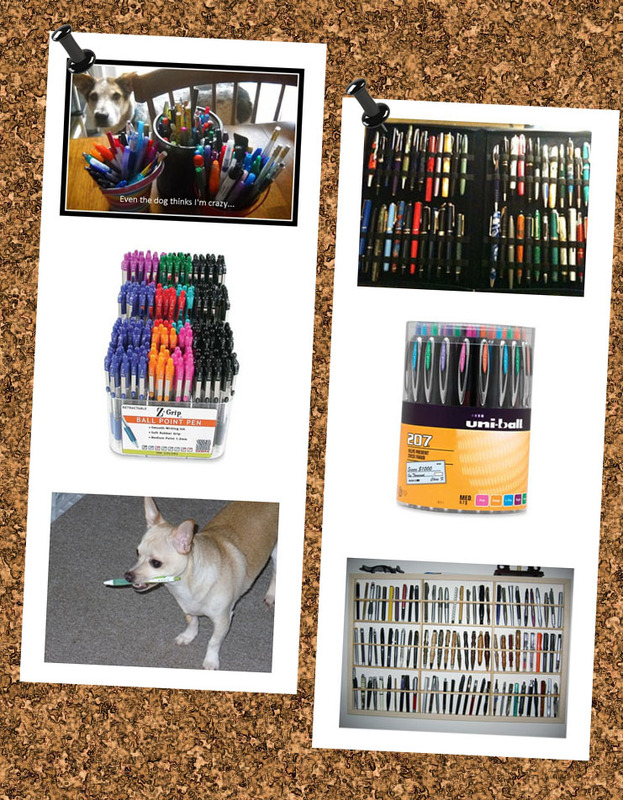 Pens – it’s just a harmless addiction! Ah, pens. Nothing in the office supply world quite engenders a heated debate like pens. People are serious about them, okay? And don’t get me wrong, I’m not condemning. I have been in more debates about the merits of Papermate versus Pilot than you can shake a stick at! I love my pens. I have favorites. I get angry when they go missing. I don’t even like it when my husband takes a pen off my desk at home. I’m sure my expression resembles something like a wolf’s does when another animal approaches its kill. That’s my theory anyway, because he usually backs away slowly, his hands stretched out in front of him in submission. People take pens so seriously that I have witnessed a meltdown when one they’ve ordered online came in incorrectly. Whether it’s the wrong color, the wrong thickness, the wrong barrel color…it’s not a pretty sight. Oddly enough, I find myself almost rooting for the outlandish response. I would be so miffed if I ordered a pen and it was incorrect! I have ordered clothes that were sent incorrectly and not been so mad. Pen addicts, or connoisseurs if you prefer (I do. The other way makes me feel dirty), take their writing instruments very seriously. Whether its ball point ink or gel, fine or broad tip, comfort soft grip or straight barrel, there is a method to the madness. Strangely enough, and I don’t know how many people are out there like me, I buy pens just to buy them. I have my favorite, the brand that I have bought for years in the ink color and tip size that makes me happy every time I write with it, but I still buy “other” pens. Most I don’t even use more than once, but try and borrow the thing from me. I’ll need a copy of your photo I.D. please. My desk drawers have pens rolling around, all capped, all waiting for me, in more colors than a rainbow. When I see a new pen I haven’t seen before, I buy it. I don’t need it, but…it’s a pen! I have to have it! What puts us on this path to find ink perfection? Are we all closet perfectionists or have massive cases of OCD? Who knows? I’m not spending money in therapy to find out. One of my favorite movies even highlights the love a lot of people have for pens. It illustrates that if we have something worthwhile to write about, we want to have our favorite pen (and the best writing paper-but that’s another blog) to do so. In Roxanne, Rick Rossovich is coercing Steve Martin into writing a letter to Daryl Hannah, and he tells him “Get your favorite pen”, because even a moose like Rick Rossovich (his character, not him per se) knows that to do the work properly, you have to have your favorite pen. Previous Post I always wanted to be a June bride! Next Post A little taste of summer – my Key Lime Pie recipe!